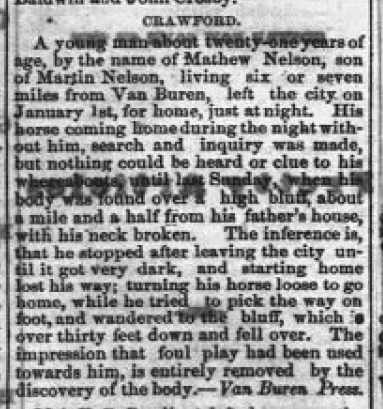 A young man about twenty-one years of age, by the name of Mathew Nelson, son of Martin Nelson, living six or seven miles from Van Buren, left the city on January 1, for home, just at night. His horse coming home during the night without him, search and inquiry was made but nothing could be heard or clue to his whereabouts until last Sunday, when his body was found over a high bluff, about a mile and a half from his father’s house, with his neck broken. The inference is, that he stopped after leaving the city until it got very dark, and starting home lost his way; turning his horse loose to go home, while he tried to pick the way on foot, and wandered by the bluff, which is over thirty feet down and fell over. The impression that foul play had been used toward him, is entirely removed by the discovery of the body. – Van Buren Press.